A WELL PRESENTED, THREE BEDROOM semi detached property, being within WALKING DISTANCE distance to BUCKINGHAM Town Centre and its amenities. The property is also in CATCHMENT for local schooling, including the ROYAL LATIN GRAMMAR SCHOOL. Accommodation over two floors comprises: Reception hallway, ground floor cloakroom, sitting room, kitchen/diner with French doors leading onto the rear garden, integrated gas hob and electric oven, on the first floor, landing with large airing cupboard, master bedroom with built in wardrobes and dressing table unit, en-suite shower room, bedroom two with built in wardrobes and drawer units, bedroom three and family bathroom. There are fully enclosed gardens to the rear with single garage and parking. EPC Rating B. Under stairs storage cupboard, Karndean flooring, central heating thermostat, stairs rising to first floor, radiator. White suite of low level w/c, pedestal wash hand basin, tiling to splash areas, extractor fan, Kerndean flooring, radiator. Upvc double glazed window to front aspect, radiator, coving to ceiling, television point. Karndean flooring, radiator, Upvc double glazed 'French' doors to patio and rear garden. Airing cupboard housing hot water tank with linen shelving as fitted, access to loft space. White suite of low level w/c, pedestal wash hand basin, tiling to splash areas, extractor fan, shower cubicle width shower as fitted, glazed screen. Upvc double glazed window to front aspect, radiator, a range of built in wardrobes, storage drawers under and shelving to side. 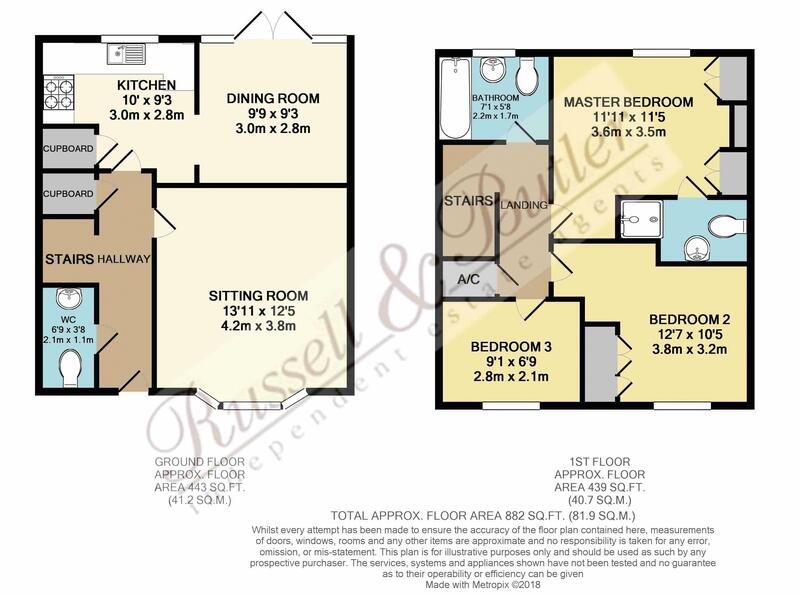 White suite of low level w/c, pedestal wash hand basin, panel bath with mixer tap and shower attachment, half height tiling to walls, vinyl flooring, radiator, extractor fan, Upvc double glazed window to rear aspect. Laid mainly to lawn, paved patio, personal door to garage, fully enclosed by brick wall and panel fencing. Single garage with up and over door, light and power connected, personal door to rear garden, parking to front. All mains services connected. Council tax band D.